T-Rax is a Python-based program for analyzing spectroscopic measurements during laser heated diamond anvil cell experiments. Currently, it only works with the Princeton Instruments SPE file format. Particularly, It provides the capability to obtain temperatures during laser heating from fitting a Planck curve to the spectroradiometric measurement signal. It is possible to select ROIs for two sided measurements and spectra are fitted automatically to give fast visual feedback. 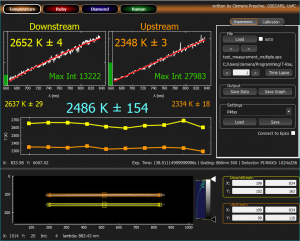 Multi-frame measurements will be displayed as temperature series. 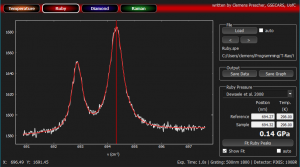 Additionally, T-Rax can be used to obtain pressure in the sample chamber by fitting Ruby fluorescence peaks or the position of the diamond edge. Several pressure calibrations are available and spectra can be processed automatically. T-Rax is mainly distributed via an open- source repository at http://github.com/CPrescher/T-Rax. However, since some of the required packages can be hard to install by non-expert end-users, I also a provide executable package for Windows which can be downloaded by using the link below. T-Rax is cross-platform compatible and has been tested on Windows 7, Windows 8, 10 Mac OS X and Linux Debian systems. If you need executables for other operation systems than Windows 64-bit please contact me. Currently, there is no manual available. The program should be pretty much self-explanatory, but if you need help, please just contact me. Also if you want to write a manual, I would be happy about it. T-Rax is currently employed for online data processing and post experiment data analysis at ID13 GSECARS, APS. Also several inhouse labs are starting to use it.